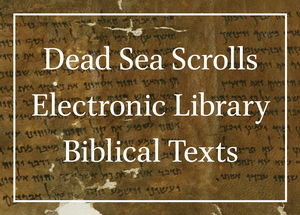 The Dead Sea Scrolls Electronic Library presents a complete Hebrew transcription and English translation of the Biblical texts, together with high-resolution images. The contents of this online publication is identical to that of the Dead Sea Scrolls Electronic Library Biblical Texts CD-ROM, published by Brill and Brigham Young University but its interface is adapted to Brill's online platform for reference works. 4Q26 = 4QLevd 4Q83 = 4QPsa 4Q483 = 4QpapGeno or papJubj? The contents of this online publication is identical to that of the Dead Sea Scrolls Electronic Library Biblical Texts CD-ROM, published by Brill and Brigham Young University in 1999. Its interface is different. The interface of Dead Sea Scrolls Electronic Library Biblical Texts Online is different from the CD-ROM because it is adapted to Brill's online platform for reference works, BrillOnline Reference Works. The publication is divided into entries. One type of entry gives, for each Dead Sea Scrolls text, the Hebrew (and sometimes Aramaic), an English translation, and the corresponding passage from the Codex Leningrad. These three texts are placed beside each other for easy comparison. The entry is ordered by fragment (or sometimes column), and each fragment has a photograph, mostly from the collection of the then Palestine Antiquities Museum (now known as the Rockefeller Museum).The photograph allows comparison with the diplomatic edition of the Hebrew text. Click on a photograph to expand it in a window on the current page; right-click and select "Open link in new window" (or similar wordings) to open the photograph at maximum size in a new window. That window can be positioned next to the transcription and translation of the text in your current window, enabling side-by-side comparison. Note that the numbers preceding the Hebrew text are the lines numbers; Hebrew bible books and verses may be found in superscript. Philologically certain text is rendered in black; uncertain text is an orange/brown colour. Reconstructed text is placed between square brackets. The other type of entry gives, for each verse of a book of the Hebrew Bible, all extant fragments. In many cases, only one example of a Biblical passage can be found in the Dead Sea Scrolls, but in numerous other instances, there are several copies, sometime more than a dozen. These copies are presented below each other. Note that the numbers preceding the translation are verse numbers. The same applies to the text of the Codex Leningrad. Users of Dead Sea Scrolls Electronic Library Biblical Texts Online can navigate from one entry to the next (or the previous) by clicking on the navigation arrows at the top and bottom of every entry. The upward arrow leads to the list of entries. This is either the list of Dead Sea Scrolls Biblical Texts ordered by cave and text number, in the case of the entries with the diplomatic editon, translation and Codex Leningrad text, or the list of Dead Sea Scrolls Biblical Texts ordered by the books of the Hebrew Bible. Both lists can also be found under the tabs Cave Order and Masoretic Text Order on the homepage of the publication, which is where you are now. Besides a short description of the publication, there are two other tabs on the homepage, one links to the scholarly introduction to Dead Sea Scrolls Electronic Library Biblical Texts as a whole and to the explanations pertaining to the translation, the other is the how-to you are reading right now. At the top of every page on BrillOnline Reference Works, there is a search field. This searches both content (full text) and metadata. The search results are ordered by relevance (as determined by the search algorithms). Re-ordering from old to new or vice-versa is possible. Click on a search result to open the entry. Use back space to return to your search results, or navigate to the next (or previous) result using the arrows at the very top of the entry. Advanced Search is not a useful option for this publication. All entries contain hyperlinks (blue text). Such links can be found in the entry table of contents, for navigation to other parts of the entry. There are also hyperlinks to other entries. Entries with text and translation will often refer to entries with text copies, and vice-versa. Sometimes a blue text will not be a hyperlink; instead, clicking on such a blue term brings up a list of search results, all entries contains that terms. This is useful, for example, to get a complete overview of all Dead Sea Scrolls texts that contain a certain Hebrew Bible passage, or an overview of all PAM photographs of a certain fragment. Please refer to the platform's help section for more detailed information about Search and other features. There are also dedicated Help sections for Scholars and Librarians. Note that Dead Sea Scrolls Electronic Library Biblical Texts is also available from Brigham Young University. Not in the form of a CD-ROM, but as a set of electronic books which can be read and linguistically analysed through the WordCruncher software. Please contact Brigham Young to download the software and the books.